It is an exceptionally cold night when I go to watch The Invisible at the Blue Elephant Theatre. Tucked away from Walworth Road in London’s Elephant and Castle, the theatre is a very intimate space and makes the experience of watching a show quite intense. As an audience member it is as if you are on the stage and part of the show. 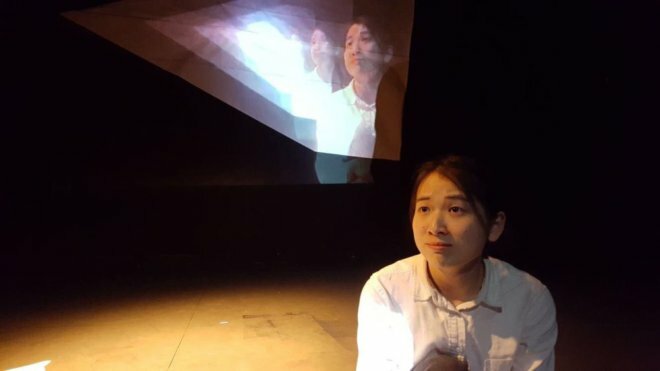 I enjoy fringe theatre as you often stumble on something which is unique, usually a very personal account delivered by the writer or performer. There are fewer grandiose scenes than in mainstream plays and you are treated to an intimate piece of art. It’s one of the great treats of being in a city like London. 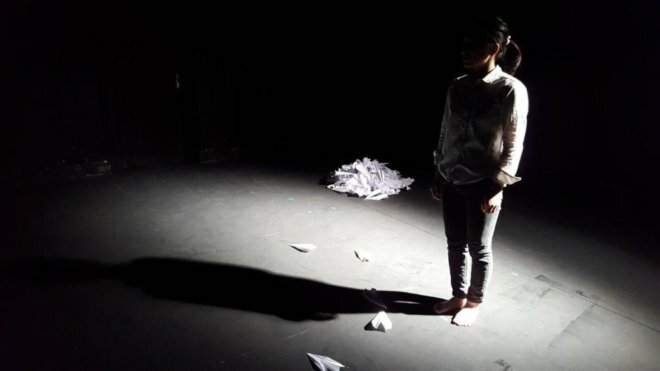 The Invisible is a one-woman show, written and performed by Yuyu Wang. It is her story of leaving her home and coming to the UK to study, subsequently feeling both the need to blend in but also to be seen. Perhaps that is the quandary we all face to some degree. As a daughter of immigrants myself there are moments where I can really empathise with her feeling of not belonging, of being on the periphery and often ‘othered’ by the dominant group. The show starts off with Yuyu Wang describing her journey to the UK. She does this by repeating the lines of a recorded voiceover. It is slightly disorientating and I do not entirely catch the words. I have to strain to hear. It is unclear if this is simply to create an artistic effect or so audience members feel the disorientation felt by people that are new to this country: how they must strain to hear if English isn’t their first language or the effort of trying to listen to people who may speak a little too quickly or in a local dialect. This feeling of being unsettled or disorientated continues. It is reflected in some unusual and perhaps confusing moments of staging. Yuyu Wang spends significant time making paper planes and, on two occasions, chases them to the point of exhaustion. At one point it seems she may pass out as she is unable to continue running. It is not entirely clear what the purpose of this action is and she is not able to continue speaking intelligibly so it affects the flow of the play. The play evokes strong feelings of homesickness. Yuyu Wang describes not being able to see her grandfather before he died. “He didn’t wait for me,” she says as she cries. But rather than sitting with this she abruptly changes the subject and starts eating an apple (her mum has told her to eat plenty of fresh fruit and vegetables). It feels disjointed. At times these moments feel like improvisation with awkward consequences. There is interesting use of media throughout the play, though this is often a little distracting and occasionally the dialogue and flow of the play is lost. 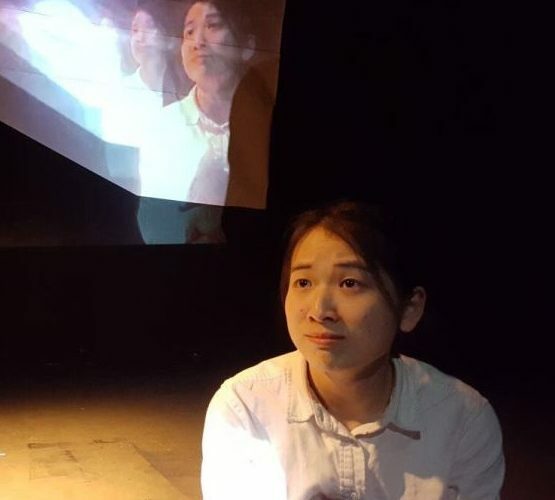 Yuyu Wang often films herself on her mobile phone and this is projected on a screen behind her. She also has an audio recording of her voice speaking lines which she then repeats on stage. It suggests the use of media in communicating with people who are far away. More could be made of this, particularly in the digital world where many of us have global connections. There is a sense that technology can both increase loneliness (if that is the only way we communicate) or it can connect people who may otherwise feel very isolated, such as people who have left their friends and family to study or to create a new life. 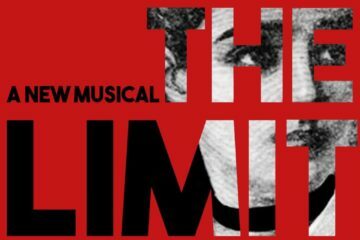 The play is meaningful especially during these challenging times in the UK post the EU referendum and during the Brexit negotiations. Politicians used the EU referendum to play political football with the issue of immigration and were quick to ‘other’ people who were not British, most starkly in the awful poster from Nigel Farage and UKIP showing a queue of refugees. This climate of fear makes it harder for everyone who wasn’t born in this country or isn’t white; it is hard for EU migrants, hard for children of immigrants and other international people who choose to work, live and study in the UK. In this context, The Invisible strikes a painful chord for all those either directly impacted or those who have witnessed the tone of dialogue about race and community relations of late. The Invisible is an awkward but warm play. The warmth comes from Yuyu Wang because her story resonates. The ideas of homesickness, not really belonging and feeling invisible reflect many people’s experience, not only people who have travelled as far as Yuyu Wang. She has a wonderful charm. 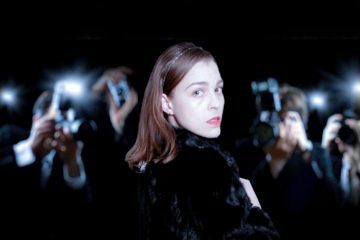 The Invisible does feel very much like a piece of work in development with some very rough edges but it is still interesting, engaging and leaves me with a sense of connectedness. Image one shows the head and shoulders of Yuyu Wang in front of a digital and repeated representation of her. She looks like she is crouched down with the image above her and to her left. She wears a white shirt against a dark background with only some of the stage underneath her lit. Image two shows Yuyu Wang, again in white shirt, standing on stage. There is a heap of paper planes behind and to the right of her with a few strewn about her feet. She is strongly lit from behind causing a shadow to fall in front of her and to her right.